Have you entered the cultural training & development contest yet and grabbed a chance of winning a free Life Lenses assessment? No? What are you waiting for – deadline is June 15th. Great training and development means being aware of governance factors. Gover who? Governance factors are all things related to the physical space and environment that our training and development takes place in. 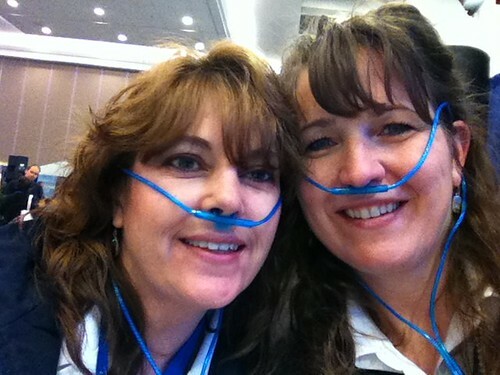 I was intrigued to learn at the recent BCHRMA conference oxygen bar display booth (that’s myself and Maryanne Lockwood partaking) that today’s air is made up of about 19-21% oxygen. The oxygen bar gives you 50% oxygen. Interestingly 200 years ago we had 30% oxygen in the air we were breathing. room temperature: I once did a workshop in the middle of winter in a room where the heating was broken. Myself and participants clad ourselves in winter coats, mitts and hats. Acknowledging that I didn’t have any control over the temperature (oddly, it was controlled in another city) but that we had someone working on it was critical to continuing. physical space: despite clear instructions that our workshops require participants to have room to move about, one workshop had folks practically sitting on top of each other we were so so squished into a tiny room. lighting: some participants, as with other governance factors, don’t particularly notice the light in the room while others are very keen observers. If the room I’m training in doesn’t have natural light I mention it (to appease those who have already noticed). If the blinds on the room can be moved I invite participants to change them as they see fit, particularly as the light shifts as the day progresses. What was a nicely lit spot in the morning can be the source of blinding glare in the afternoon. ambient noise: the hum of a PowerPoint, the whir of a fan, outside traffic etc. all can drive some participants nuts, while others remain unaware. I try to have my antennae up and ask participants if they’re being bothered. seating: uncomfortable chairs, not enough chairs, chairs arranged so not everyone see each other or you are all a hassle to deal with. Clear communication with the training venue can go a long way in preventing problems. physical layout: how the seating is arranged has a big effect on what kind of training activities you can do. For example, fixed, cantilevered seating makes mixing participants challenging (seating that gradually rises the further the rows are from the stage). Large obstacles in the middle of the room (like floor to ceiling pillars or a massive fireplace, I get a migraine thinking about that training experience) are also challenging. I always tell clients it’s imperative that participants be able to see and hear myself and each other. There’s no equivocating on that one. sound: if people can’t hear you it doesn’t matter how good you are. Know how many people you can speak to without a microphone and make sure you have a good quality sound system if the number of people is above that. For example I can speak to about 75 people without a microphone, while our entertainers can go up to about 100. If you’re using a sound system make fast friends with the technician and leave enough time to do an unhurried sound check. Have good training content? Check. Have good training delivery methods? Check. Then don’t ruin it all by not paying attention to governance factors. What type of change are you trying to effect? Does it line up with your core purpose & power relationships? Can you sum up resilience in a song? Bella can - listen up.